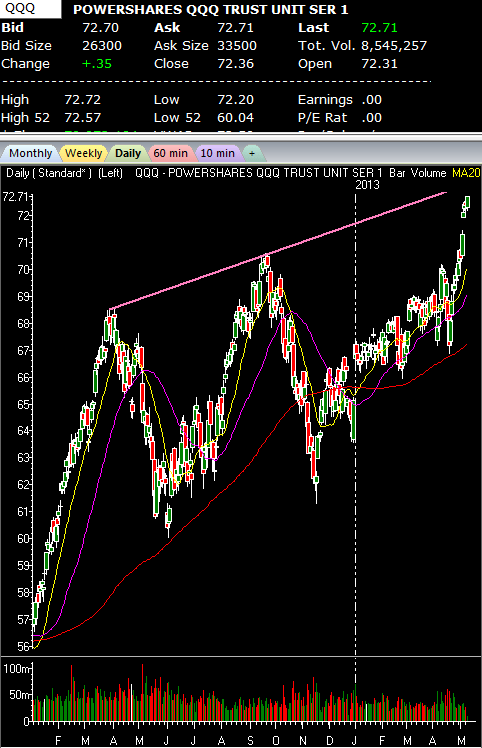 The NASDAQ 100, PowerShares QQQ Trust, Series 1 (ETF) (NASDAQ:QQQ) has surged dramatically in recent weeks. This is on the back of a major up moves in Apple Inc. (NASDAQ:AAPL) and Google Inc (NASDAQ:GOOG). As this index spikes there is a very important level approaching. Connect the pivot highs from 2012. That gives us an approximate level of $73.50. The current price is $72.70. That is the target and spot for a pull back. Note the chart below and enjoy.